Nicole Chisamore was born and raised in the Kingston area, and is a graduate of the St. Lawrence College Office Administration program. Over the course of a 15 year working career in Toronto, she held senior administrative positions in manufacturing, automotive and accounting sectors. 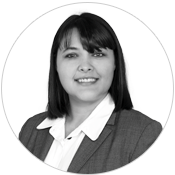 Nicole is our client service and administrative coordinator, and Brookfield GRS liaison, and is diligent in working with our clients through processing of the details and paperwork involved in each buyer and seller transaction.